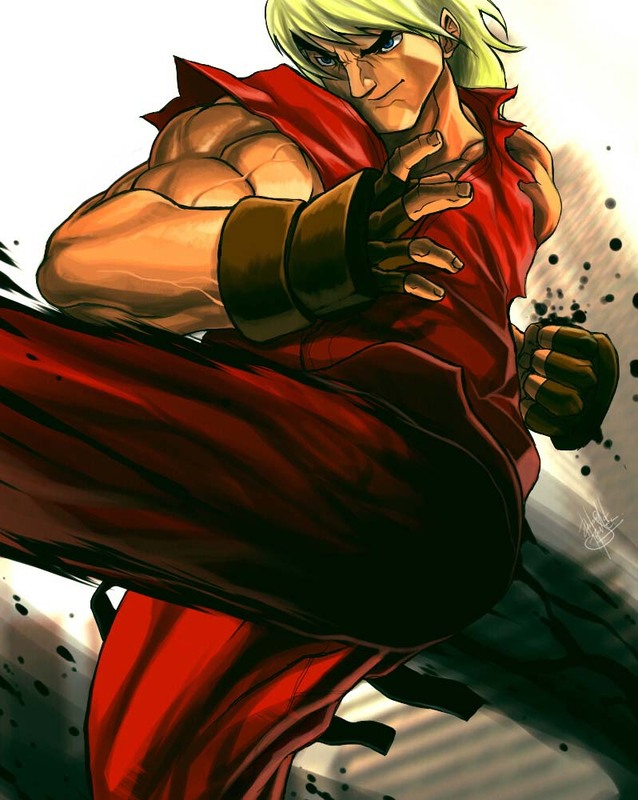 Ken Masters is one of the most recognizable Street fighter characters, and even though he takes a back seat to Ryu in most cases, I enjoy his character and fighting style more than Ryu’s. I guess I just have a lot in common with this guy. I enjoy the fact that he’s partially Japanese and American, and even though his move set’s pretty similar to Ryu; His rash style and his goofy charm makes him a fun character to play as. He’s Ryu’s rival, so that’s something to be said; but he’s also a good friend and doesn’t always have to be in the spotlight; which is cool to me. I enjoy his little gestures and his cheeky nature; and I guess I just see him as a darn awesome character. Since Ken is two-thirds Japanese; I had to go for a Japanese brush technique on this piece. Choosing the items for the collage was tough; I had many ideas but I didn’t want to make it too heavy. So I went with a Red base; it’s is his trademark color; and his temper can get out of hand sometimes, so I had a fire-themed color scheme for the first layer. He’s a good-natured guy, so I depicted him with a simple smile this time in place of something more intense like I would usually do. I wanted to capture his warm-nature; how he is with his family and friends; but also give a good hint at his fiery determination; he still aims to be the best, and he’s definitely got some fire in him. He’s also a ‘cool’ guy, so I added some hints of blue to represent that. If you look closely you might be able to see some stars and stripes; hinting at his American homeland and family. 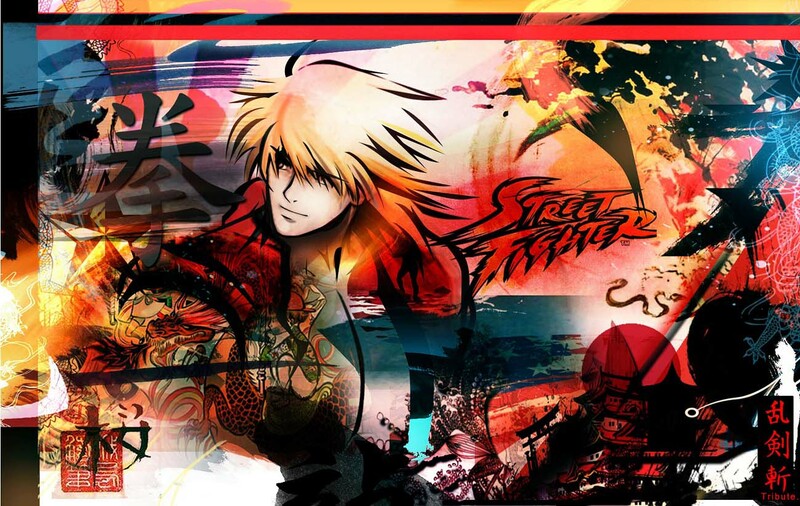 And of course, the ink swipes pay homage to the SFIV art style, and also to the Japanese nature of the piece. But all in all; I wanted flow, fire, and Japanese goodness in this piece. I had a light sketch done in pencil, and then scanned it and made the collage layout and inked it all on Photoshop. I usually do my arts more traditional-based; but for this one I had it done almost completely digital. I like using good amounts of contrast in my art; so I a lot of fun on adding the ink swipes and meshing the whole layout together. 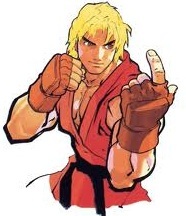 Ken is a fast and agile character in Street Fighter. Besides his agility, he can deliver severe damage to his opponent. 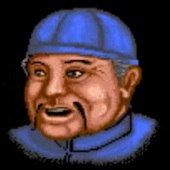 Ken is a very charm character which is the most things I like about him. 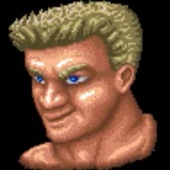 Unlike Ryu, we often see Ken smiles. His Shinryuken and Shippujinraikyaku is the best super in Street Fighter.. I tried to deliver my creativity in this piece by giving Ken a dynamic pose. I was inspired by his focus attack in SFIV with ink splattered around his body which I think add to the awesomeness of the move. His smile in this piece reflects his entire persona. I used paint tool sai to draw the outline and the colouring. Some tune-ups were done in Photoshop. 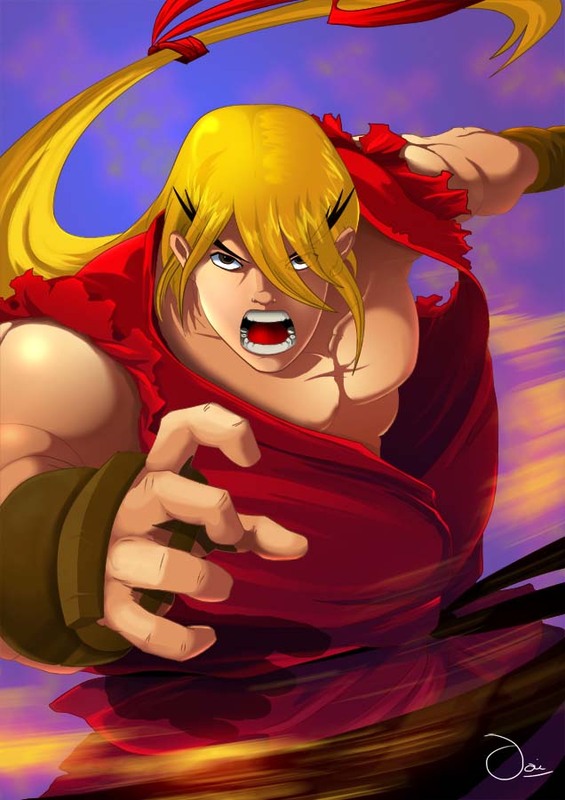 Ken Masters is the 2nd playable character in the original Street Fighter, and returned together with his friend and rival Ryu in just every sequel.